Flooding is expected to worsen in the coming days as the Coast Guard continues its relief efforts. The emergency is by no means over in North Carolina. 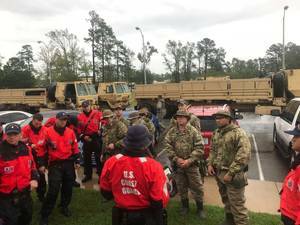 As flooding is expected worsen across the Carolinas later this week in the choppy wake of Hurricane Florence, Coast Guard units across North Carolina are continuing to assess damage, and respond over a wide geographic area. Florence, responsible for 36 deaths in three states, continues to impact the Carolinas. Major waterways across the tri-state area of North Carolina, South Carolina and Virginia remain well above flood stages, and were expected to rise through the weekend before cresting, according to the National Weather Service said. North Carolina Governor Roy Cooper urged local residents to remain alert even as the worst of the storm appeared to be over. Florence poured as much as 36 inches of rain in some coastal areas, and up to 11 inches as far inland as Charlotte, more than 200 miles inland. More than 121,000 homes were still without power across North Carolina as of Thursday morning. According to a September 19th News Release, Coast Guard air and surface crews rescued 1,103 people and 419 pets since Hurricane Florence made landfall Friday. Working with local county partners, Coast Guard crews were able to help assess and clear 765 miles of road, assess 23 bridges, and 14 dams. The ports of Wilmington and Morehead City are open with restrictions as port reconstitution operations continue. Port assessments identified more than 100 aids-to-navigation discrepancies, 24 were corrected. The Coast Guard urges mariners to report any waterway discrepancies to Sector North Carolina at 919-722-4873.